This page is from “Isle of Death”, a thin re-write of the famous short story “The Most Dangerous Game”, by Richard Connell. It first appeared in the EC Comics horror anthology, Vault of Horror 13. I love the inking style overall varying line weights, leaving gaps in lines creates an energetic spontaneous feel. In the first panel, the way he spots blacks in the background and simplifies the whites on the pilot’s uniform creates a pleasing poster-like effect. 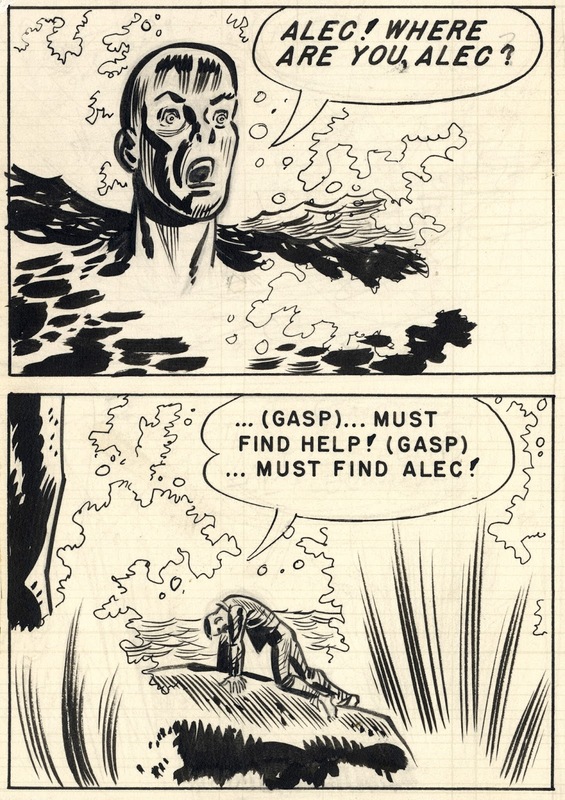 The efx lettering in panels 2 & 3 augments the spontaneous, off-the-cuff feel, both in the application of ink-via-brush and the way the “SPANG” in panel one is cropped by the panel border. 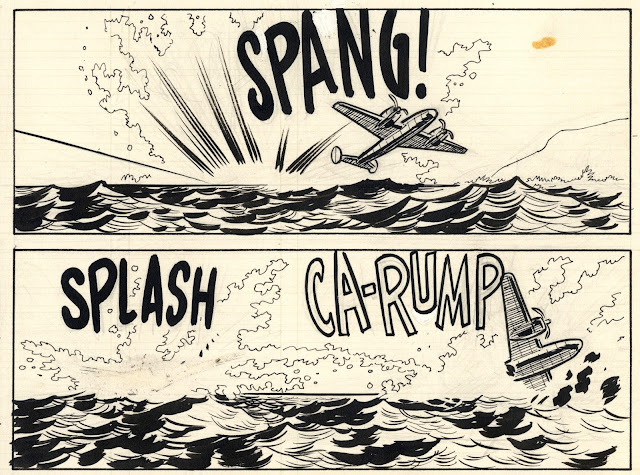 Panel 3 is dominated by the “SPLASH” and “CA-RUMP” efx, with the crumpling airplane mostly obscured by splash and impact as it hurtles toward panel-right. 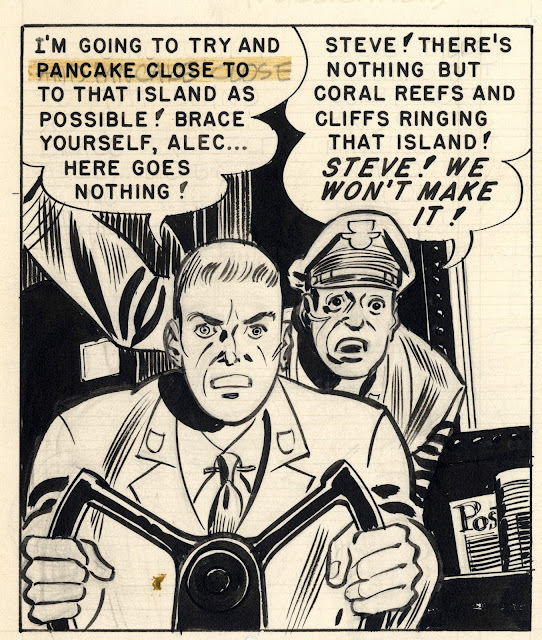 This cinematic effect is achieved using graphic-comics narrative grammar. 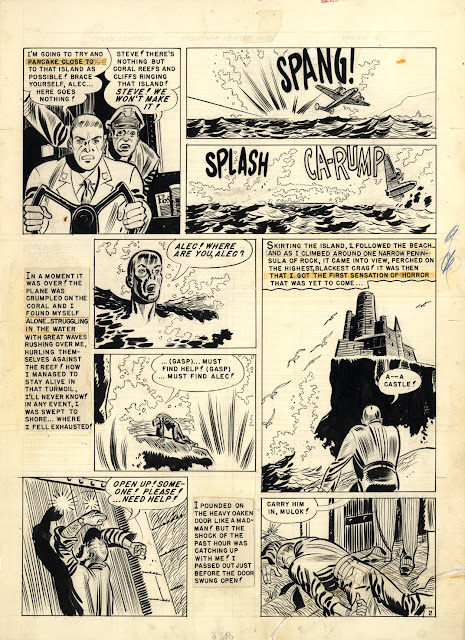 As in the rest of the page, the inking seems bold and crude but is actually subtle and nuanced: observe the rhythmic manner in which the horizon line of the ocean is broken by wave chop and impact of the crashing aircraft. Panels 4 & 5 are another quasi-cinematic pair: in 4) the pilot protagonist rises out of the black water, the surf on the right side of the panel making him seem floating, disembodied ; in 5) the camera pulls out to show him climbing onto the rocks, the technique of radiating groups of brush lines to denote the impact of crashing waves is repeated from panel 2, more symbolic than descriptive; one cannot imagine Wally Wood or Al Williamson using this device. But to my eye it is quite effective, graphically and dramatically. Panel 6 shows is an establishing shot of the villain’s castle looming overhead atop a distant cliff, portrayed simply and dramatically by a simple black shape with minimal detailing separated from the foreground by graphically depicted surf and foam. I like the simplicity of the rendering of the castle, letting gaps in the lines symbolize distance. I also appreciate the way the smooth, long brushstrokes on the pilot’s uniform gives the impression of sodden cloth. Panels 7 & 8 are another pair; panel 7 is shot on a tilt, the horizontal and vertical lines of the composition are now at angles giving a feel of inevitability, as though the hero is falling into the door. I like how the sets of radiating lines on the back of his shirt echo the surf impact lines from panels 2 and 5. 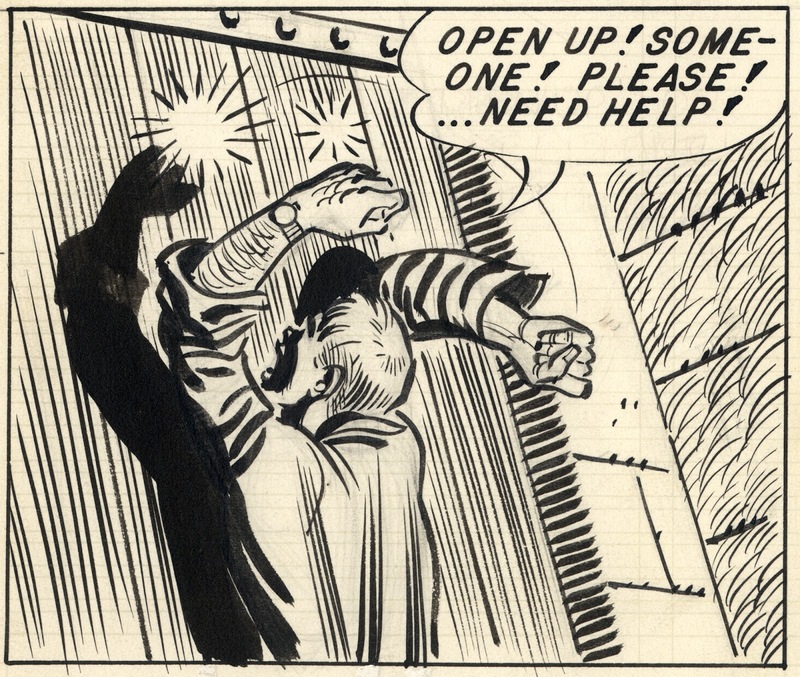 Panel 8 is notable for how the drapery on the pilot’s prone form depicted as a series of bold, rhythmic lines and shapes implying the body inside, strangely dynamic, as though the unconscious man was running. I’m struck by the resemblance to Jack Kirby’s highly abstracted depiction of human form especially in his later 70’s onward work. 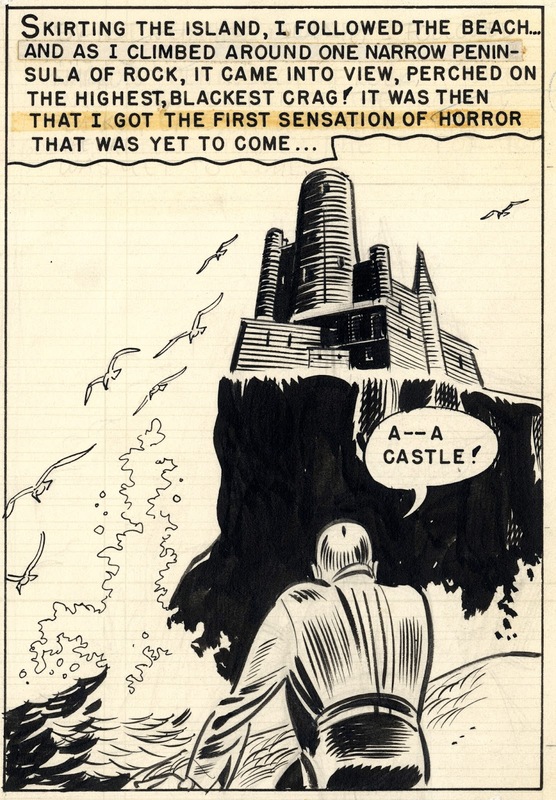 I assumed, when I first saw this work in the late 70’s, Kurtzman worked like Kirby, quickly and freely, with no second-guessing or re-doing. I was shocked and slightly disappointed to learn that Kurtzman was agonizingly painstaking, going over his drawing repeatedly to achieve the desired affect, to the point where he couldn’t make any money at it. In fact, the whole reason for Mad Comics was that the publisher, William Gaines, thought editing a humor book would be easier and quicker for Kurtzman.